"Scientists on the New Horizons team are using this and similar images to map portions of Charon otherwise not visible during the flyby," the officials added. 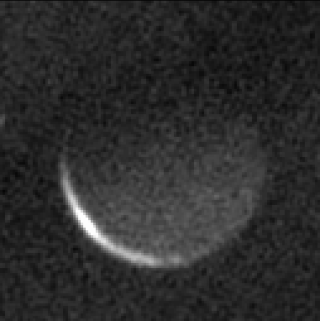 "This includes Charon's south pole — toward the top of this image — which entered polar night in 1989 and will not see sunlight again until 2107. Charon's polar temperatures drop to near absolute zero during this long winter." At 753 miles (1,207 km) in diameter, Charon is more than half as wide as Pluto itself. The dwarf planet's other four moons — Nix, Hydra, Kerberos and Styx — are all tiny by comparison. For example, Nix and Hydra measure just 33 miles (54 km) and 27 miles (43 km), respectively, in their longest directions, while Styx and Kerberos are even smaller.